Ambulance service in North Kansas City is provided by the NKC Fire Department. Our Emergency Medical Services are provided by full time 24/7 EMTs and Paramedics operating two advanced life support ambulances. If you call 911 for a medical emergency, you can be assured that The North Kansas City Fire Department will respond rapidly and will deliver the most professional medical care possible. North Kansas City residents can take comfort in knowing that they are in the best hands. Is there a charge for ambulance/EMS services to North Kansas City residents? Yes. All North Kansas City residents are responsible for their ambulance bills. The base fee for an ambulance is $850.00 and $12.00 per mile. How do I inquire about my ambulance bill? Please call that Fire Department at 274-6025 if you have any questions regarding your ambulance bill. Can I request a non-emergency transfer? No. You cannot request a non-emergency transfer. Non-Emergency transfers are only requested by NKC Hospital employees. You can however, call 911 and request a lift assist. The FD will be happy to assist patients into their homes, once they have returned from the hospital. The first official ambulance service for North Kansas City, Missouri began in 1937 and was overseen by the Police Department. 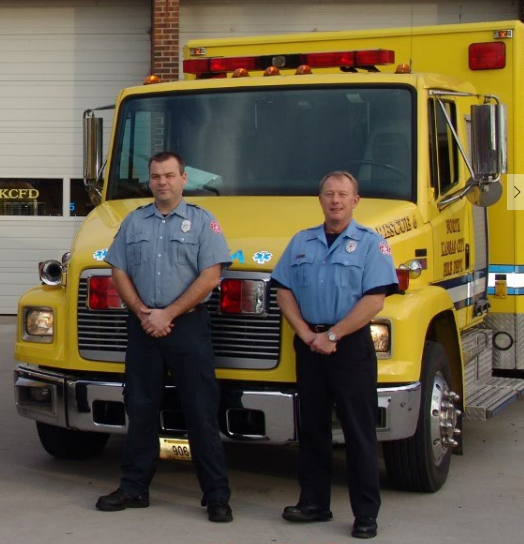 Through the years, it was managed by a number of private companies until the 1970’s, when the North Kansas City Fire Department began providing ambulance service for its residents. It was at that time four firefighters attended an Emergency Medical Technician course offered by the University of Missouri. In 1975, two of the first Paramedics licensed in the State of Missouri were members of the North Kansas City Fire Department. These events became the foundation for the service being delivered today as the system has evolved into all members working at the EMT or Paramedic level. Patient care is delivered 24 hours a day and seven days a week with two advanced care ambulances. This service has expanded to fire trucks, which are also capable of advanced life support delivery. 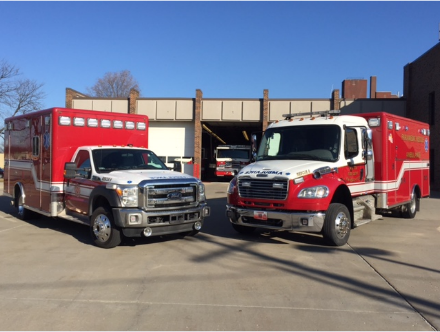 The North Kansas City Fire Department has always worked closely with area hospitals in identifying patients in need of critical care and ensuring rapid transport to the most appropriate definitive care facility. Paramedics are capable of obtaining 12-lead ECGs, end-tidal CO2, pulse oximetry, and a myriad of other diagnostic tools. As always, the Paramedic is able to notify the hospital prior to arrival, saving valuable minutes in the emergency room. With state of the art equipment, enhanced care policies, and the addition of electronic reporting in 2014, the department continues to evolve as a pioneer in emergency medical care not only in the State of Missouri, but the nation as well.